The Metropolitan Asylum Board (MAB) was using some of its other London hospitals for smallpox cases, but this was met with opposition from local residents. The lack of hospital beds meant that whole streets were marked off with plague flags, and isolation of cases was impossible, and epidemics difficult to control. It was to meet this emergency that, in May 1881, the first canvas smallpox camp was erected (on the site of the new hospital). The camp caused some problems for the Darenth Schools; they were about to open their new blocks when the Smallpox cases arrived so the opening was delayed. As autumn arrived it became too cold for out-door-life, the camp was struck, and the patients moved into the new blocks. All the staff and imbeciles at the Schools were revaccinated against smallpox and there were no reported cases of smallpox in either staff or imbeciles. The patients, from London, were transported direct from Deptford hospital in hired four-in-hand vehicles, which covered the 18-mile journey in 3 hours. This was the first time a systematic transport service for patients had ever been used in London. The MAB then chartered from the Admiralty the 90-gun ship Atlas and a 50 gun frigate Endymion) and adapted them for smallpox cases and they were moored off Greenwich. The MAB managers were still not satisfied. There were still not enough smallpox beds available so they purchased the Atlas and Endymion from the Admiralty. They also acquired the Castalia and equipped her as a hospital ship. This would provide another 350 beds. (The cost of acquiring and fitting the ships totalled £96,000.) The ships were now moored off Long Reach. Additional land was purchased at Darenth (Gore Farm) from Mr Morton and an additional strip from the Ecclesiastical Commissioners (1 acre, 3 roods and 1 pole between the land from Mr Morton and the roadway) for £125. The second smallpox camp was erected here and plans put into place to build ten 100-bedded blocks. Next two paddle steamers were bought for £10,000 and fitted as ambulance ships. A pier was constructed at Long Reach and wharves at Rotherhithe, Blackwall and Fulham at a cost of £42,000. Each wharf had an examination room and an isolation ward for patients unfit to make the journey and another ward for cases of doubtful diagnosis. In 1883, soon after the Darenth camp at Gore farm opened, Mr Thomas Horn Fleet (and others) of Darenth Grange, an influential landowner and probably the nearest resident to the site (apart from the children at the Darenth Schools but they were unlikely to complain), procured an injunction on the grounds that the presence of the camp was ‘injurious to the residents on his property’. The case was heard in London in November 1884. The ‘Others’ referred to were the tenants on his property. One of these was his groom, Mr Thomas Phillips. He stated that he had seen men employed at the camps drinking in the Fox and Hounds. Other witnesses for Mr Fleet said that smallpox could carry through the air for one mile and that the burial of the dead on the site also imposed a danger. Many scientific witnesses were called, but the judgement was given in favour of the MAB, especially as no cases of smallpox had occurred in the Darenth Schools in 1881, and they were much closer to the camp than Darenth Grange. After the establishment of the ships at Long Reach a strictly limited number of smallpox beds was available in London, the majority of cases were sent directly to Dartford until 1885 when the beds at the London hospitals were closed and all cases came to Dartford. Convalescent camps were set up again at Darenth to relieve the pressure of the 1884-5 epidemic and these remained until 1890, when they were converted into the Gore Farm Upper and Lower Hospital (later to become the Southern Hospital). Provision was made for the treatment of 300 patients in 15 sleeping tents. The tents were ‘double tents’ (one inside the other) so as bad weather couldn’t penetrate them. There were 2 larger marquees for day use (1 male, 1 female) and similar ones for all the staff. There were also numerous ancillary tents for commodes, sculleries and stores. As the number of patients rose extra tents were erected, and two wooden huts (the latter were used as infirmaries). Clothes that the patients had worn from the ships were sterilised in a ‘Lion Disinfector’. They were steamed at 250° and returned to the ships for reuse. Any clothes that the patient had worn from home were destroyed. A new set of clothes was given to each patient on discharge. In June 1884, as another epidemic broke out, a 2nd camp was formed to the south about 800 feet away from the 1st camp. The women and children were transferred there. The number 2 camp was more compact in design and accommodated 496 patients in 20 sleeping tents as well as the tents for staff and ancillaries. The MAB decided that a lady superintendent was needed. Miss Isabella Baker (previously Guardian for Holborn) was persuaded to take the post. She described how the patients ‘came pouring in from ships across the river with their goods and chattels like children of Israel passing through the Red Sea’. The average number of arrivals was 100 a day and everything had to be provided for them. One of her achievements was a separate brush and comb for each patient, a luxury previously unknown. She was also disturbed to find that no provision had been made for religious services on board the ambulance steamers. The tents were used all year round (unlike the first camp, in 1881, when they wintered in the new blocks for the Asylum). In winter the day tents had the flaps closed and were lighted by gas (the gas was piped from the Darenth Asylum where it was made). They were dark and gloomy until the introduction of four large windows with substantial wooden frames bedded in the floor. Steam pipes warmed the tents. Each tent had a canvas porch and a detached canvas closet, with a Moules earth commode, for night use. Blocks of closets were used during the day, as the soil was easier to remove and replace with fresh soil. The gas supply was insufficient for cooking so an open fire roaster was purchased. This was able to roast 400 lbs. of meat and supplied both camps for 2 days. To ensure a fresh supply of milk 12 cows were kept and the number was increased to 18 when required. A stock of condensed milk was kept at the stewards’ stores in case of emergency. At the time of the 1893-4 epidemic the accommodation stood at 300 beds on the ships and 800 at Gore Farm. This was considerably less than needed so the MAB increased the permanent accommodation at Gore Farm to 1,000 beds, together with the necessary staff and administration accommodation. They built additional blocks each accommodating 50 patients. The distance between Gore Farm Upper and Lower hospitals was 1,000 feet, and on the opposite side about the same distance to the Darenth Asylum and Schools. 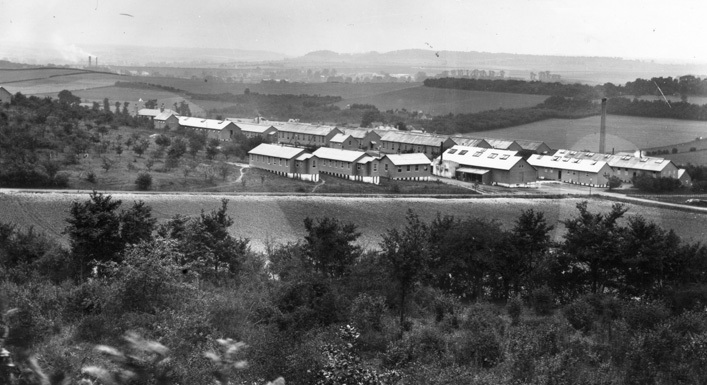 It had been proven that it was rare for patients to be fit for discharge from the camp in less than three weeks, so this was adopted as the minimum period they would stay. Visitors were not allowed except in fatal cases when precautions were taken and a visit allowed. Correspondence was encouraged and all letters from the camp were disinfected. For children unable to write a weekly progress report was sent home. Patients were expected to have breakfast at 8 a.m. This was usually: bread, butter and eggs with tea or cocoa. Dinner was at 1p.m: meat roasted or boiled varied with meat puddings, two vegetables, and a sweet of baked rice, sago, currants or fresh fruit. The meat was hot except for Sundays and occasional days in the summer when it was served cold with pickles and salad. Tea was at 5p.m. and consisted of bread, butter, jam or eggs tea, cocoa and beer, lemonade or milk according to the merits of the case. A light supper of biscuit or bread and cheese was given if requested. The meals were ample and unlimited. The hours for rising, retiring and meals were made known throughout the camp by a bugle call. Bad conduct was rare in the camps and was punished by the offender having his or her beer and tobacco withdrawn. The grounds were extensive and recreation was provided in the way of cricket, football, bowls, quoits, and swings. The recreation halls (erected in December 1884) offered a quiet space for reading, writing, chess, draughts and bagatelle. The halls were warm, light and airy and often the place for impromptu concerts. The cleansing and disinfecting of the body was an important factor in the treatment of the patients. The bathhouses could accommodate 20 people at one time, therefore, as each sleeping tent slept 20; whole tents could bathe at the same time. The rule was that each patient should bathe on alternate days, in a hot bath, with the liberal use of carbolic soap, for an average time of a quarter of an hour. A minimum of six baths was insisted on before a patient could be discharged and they had to have their bed cards signed by the nurse-in-charge after each one. When a patient was discharged he was taken to the discharging room and took off every article of clothing; he then went through another door and had a final hot carbolic bath, went into another room and was given a brand new set of clothes. From this dressing room was a door for the exit and carrying his certificate certifying his freedom from infection climbed aboard the waiting transport. The transport took them to the wharf opposite the Atlas and they were returned to London on board the Red Cross ambulance steamer. During the 1884-5 epidemic a total of 10,033 patients were admitted to the camps. Of these 9,901 were discharged recovered, 74 died and 58 transferred to the ships. The continued need for smallpox convalescence meant that huts were built on the lower end of the site during 1888-9. These were now known as Gore Farm Hospital and later became the Lower Southern. Built as a temporary hospital the huts were still in use after WW2 when some of them became the Mabledon Hospital for displaced Poles.